Perhaps the most seasonal exhibition in town right now is “Winter Greens: Seasonal Illustrations from the Lloyd Library.” The Library, at 917 Plum Street in downtown Cincinnati, is both a library and museum with rare books, botanical drawings and manuscripts that provide, for this exhibition, a long look back at our pleasure in the natural world in exactly the months when access to it is most restricted. The key to the exhibition is in one of the interesting and informative labels that accompany individual groupings of materials, this one headed “Evergreens in Cultural Traditions.” We learn from it that Christmas trees are only one of the later manifestations of added meaning to these persistent examples of continuing life in the dark months. “Evergreens have been part of seasonal celebrations for centuries,” the label points out, and goes on to say “its use as a symbol can be traced back to the winter rites of pre-Christian Vikings and Saxons and to the medieval plays given on December 24 to commemorate Adam and Eve.” It’s warming – I use that verb deliberately, in this season – to think that our comforting pleasures link to those of people so long gone. The “Cultural Traditions” label also tells us other things about evergreens: fir trees, flourishing at high altitudes, symbolize elevation; to ward off evil spirits one should burn juniper berries; ancient Romans considered cypress a symbol of the permanence of death. The labels here are almost as interesting as the objects themselves, but the illustrations in these old and older books are beautifully delineated and worth looking at carefully. One particular example is The Botanist’s Repository for New and Rare Plants, published in London, apparently in sections from 1797 to 1811. 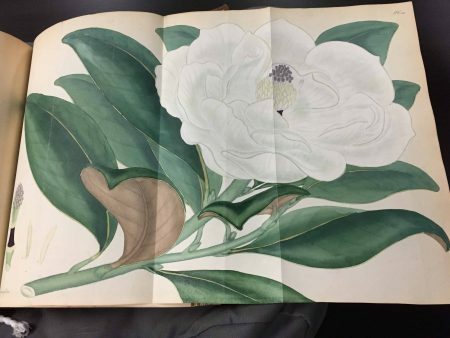 It is shown open to a fold-out illustration of a gorgeous Magnolia Grandifloria produced by the author, who was also the publisher, and is identified as a botanist and artist who “drew and engraved” the illustrations. Exotic evergreens would become only more fashionable as the 19th century took shape. Very large books were produced – Queen Victoria is listed as a subscriber to one of them, which looked to be perhaps two feet high and each page perhaps 18 inches across. She asked that it be dedicated to her late husband, a request that was no doubt gratified. Another spectacular illustration in one of these large books shows a rhododendron in a blaze of greens and pinks. One display case is dedicated to herbals, an early reason that these plants were valued and a continuing reason for their popularity today. Still another old habit: kissing under the mistletoe’s long, long history may go back to the Druids, I learned from this exhibition. Think about that, the next time someone catches you under it. The Library itself, naturally enough, is decorated for the season with greens lining the high windows. These were shedding, slightly, as is inevitable, and bits of greenery had fallen on a glass-topped case where a particular segment of the long history of decorating with greens is on view. This seemed perfectly appropriate, given the circumstances. The exhibition continues through March 17 and several interesting programs are upcoming. 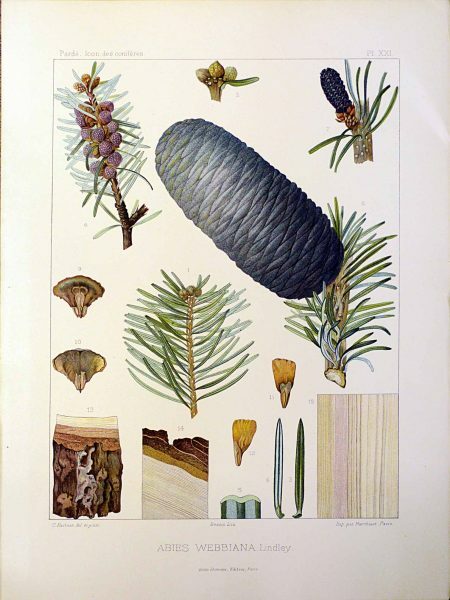 On Saturday, January 27, 1-3 p.m., Byron Baxter of the American Conifer Society will discuss the broad range of evergreen trees and their use in both landscape design and container gardening, with live specimens including that particular Queen City variety of ginkgo. “Conifers 101: From A to Z to Your Backyard” is free and open to the public. Saturday, February 3, from 10 a.m. to 12:30 p.m. Women Writing for a Change joins with the Library to present Annette Januzzi Wick and the Library staff as leaders in a workshop dedicated to “capturing through words the themes inspired by the Lloyd’s collection of winter greens.” Participants will have access to rare works with illustrations and historical accounts dating back to the 1800s. 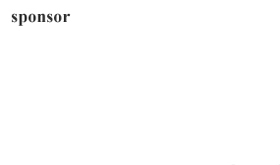 The workshop is limited to fifteen participants; tuition is $35. Late in February, on the 25th, Library programming will not take place in the Library but in Spring Grove Cemetery, for a walk from 10 a.m. to noon with Dave Gressley, Spring Grove’s Director of Horticulture. More information is available by contacting him at 513-853-4954 or dgressley@springgrove.org. Winter greens, as seen in Lloyd Library book illustrations, will be off the page and in plain view for participants in this late winter outdoor adventure. The final piece of programming during the “Winter Greens” run will be back in the Museum itself, from 1 to 3 p.m. Saturday, March 10, when Michael Vincent speaks on “The Medicinal Properties of Yews in History.” Vincent is Miami University’s Curator at the Willard Sherman Turrell Herbarium. The program is free and open to the public but reservations are required (513-721-3707 or lloydyews.eventbrite.com). The Lloyd Library is also free and open to the public; Monday-Friday 8:30 a.m. – 4 p.m. and on third Saturdays of each month; information available at LloydLibrary.org.